The kitchen and bath needed the most work in this house and both ended up being a gut job. The kitchen needed to be gutted because what was there was in such bad condition. 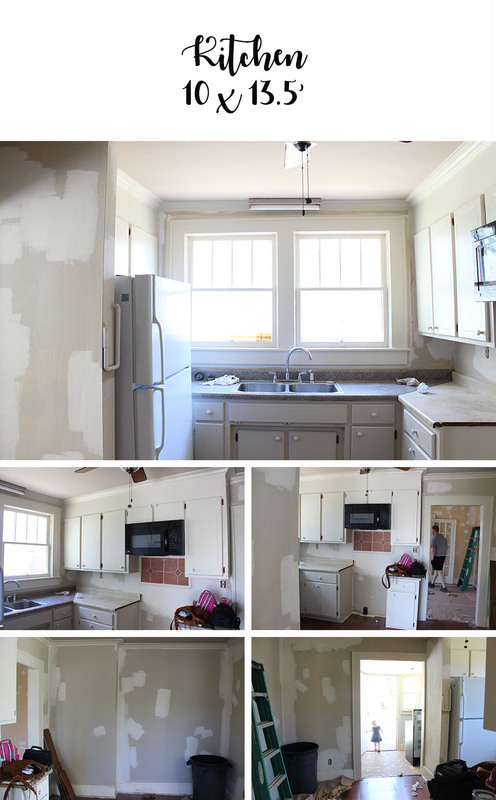 It needed a whole new floor, the cabinets weren’t salvageable and I have to admit I was a little thankful. 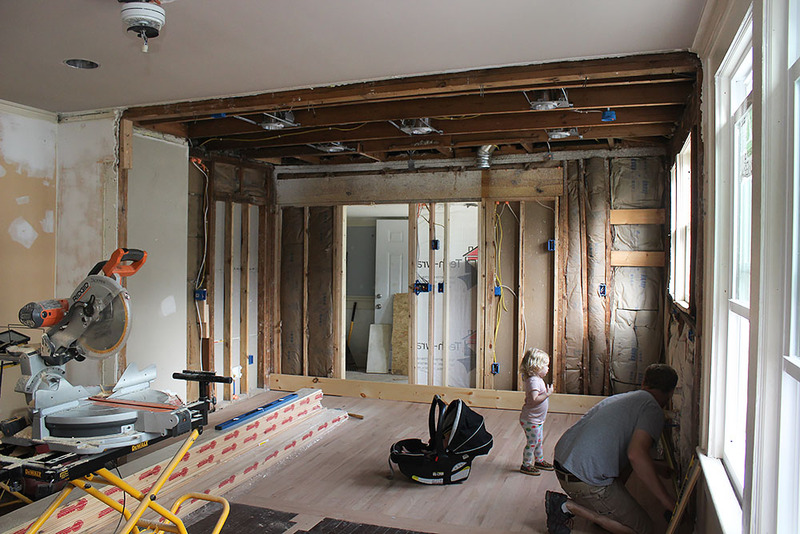 It’s hard to justify ripping out a decent kitchen, but this room was horribly laid out. And that also allowed us to start from scratch on the layout, prioritizing function and making a smaller space work really hard for us. 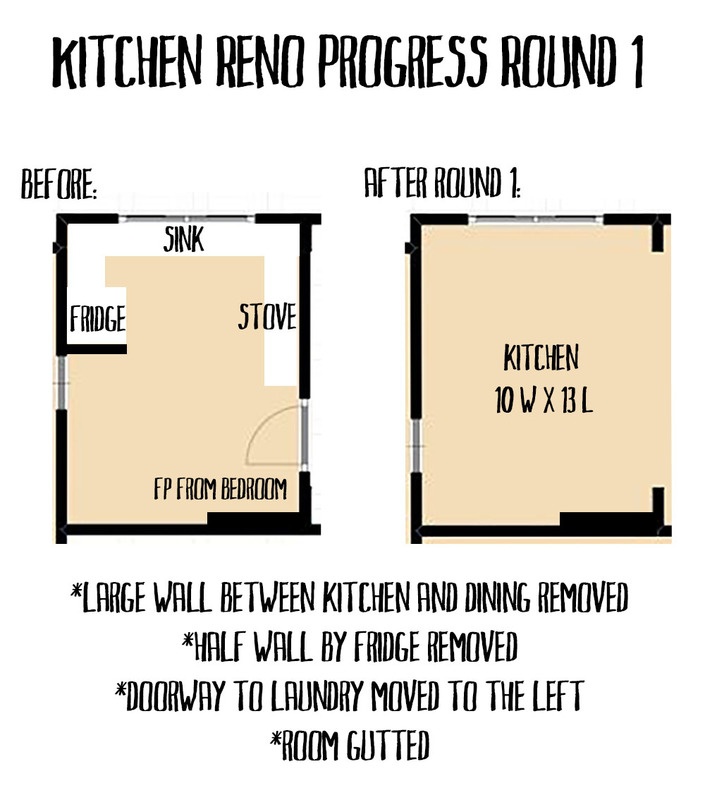 You can check out the first round of reno progress here. We put a TON of thought into how to arrange this kitchen to give us as much storage and function as possible. Let’s take a look at the first round of layout changes. Before, the wall on the left side of the kitchen was totally unused. I knew we could somehow maximize that. And all of the necessities were jammed into the other side of the kitchen. They were on top of each other, making them almost unusable! The “jut out” on the left wall in the kitchen is the back side of the fireplace from our bedroom. With where it is in the house and what an under-taking it would be to remove it, it wasn’t worth it to us and I knew we could somehow utilize that space. Once we had our big open space with the walls and everything moved, we started brainstorming layout. The good news with a small space that has several doors, windows, and things to work around is that you’re limited on what you can do. But it has to be really well-thought-out. 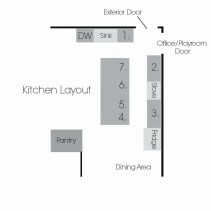 The appliances and main items were pretty easy to find the best layout. STOVE – With us moving the door to the laundry several feet to the left, that gives us a longer stretch of cabinets on that back wall and allows the stove and hood to be centered there. I love that from a design perspective because that’s often the focal point of the room. 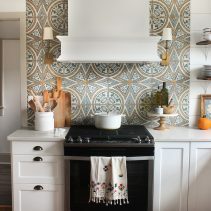 But moving that doorway and spreading that side out was a functional necessity to have the stove further from the sink. We wanted to be able to have us both in here working together, so spacing out appliances wherever we could was a priority. SINK – I love a kitchen sink under a window and that made the most sense functionally, so we left the sink placement where it was. DISHWASHER – The original kitchen didn’t have a dishwasher, so we’re placing it basically where the stove was originally. Now that we’ve opened up that wall, that’ll be a long peninsula and the dishwasher will be centered in it. We wanted it close to the sink, but far enough away that you could stand at the sink and easily load dishes. At first, we talked about having it closer and then realized when the dishwasher was open, you couldn’t even stand at the sink! Now there’s room to stand there, rinse dishes, turn and put them in. REFRIGERATOR – We moved the laundry door so that there was just enough depth there to tuck in a fridge. We’ll be spending the extra money to get a counter-depth fridge. It isn’t enough money to outweigh the added function in this tight space, especially since it’s right at a doorway. PANTRY – We brainstormed what we could do in front of the fireplace jut out. We had about 14″ of depth to worth with for that to not stick out past the beam where the wall opens. We decided to put in a floor-to-ceiling pantry there with shelves all the way up and two large doors. We have a walk-in pantry in our current house and while I love it, we realized a ton of space is wasted. In our last house, we had a pantry with really deep shelves and hated it. So, shallow shelves were exactly what we wanted functionally and this is actually going to give us a lot of storage! Once we had those main items set, it was time to nail down cabinet storage. I’ll be talking about this more later, but we aren’t going the custom cabinet route in this house (like we did at The Buffalo Bungalow) due to cost. So, that meant we had to make stock-cabinet sizes work. The appliances having pretty set places they needed to be didn’t give us a ton of options, but we did have the flexibility to move appliances an inch or two here or there for cabinets-sake. 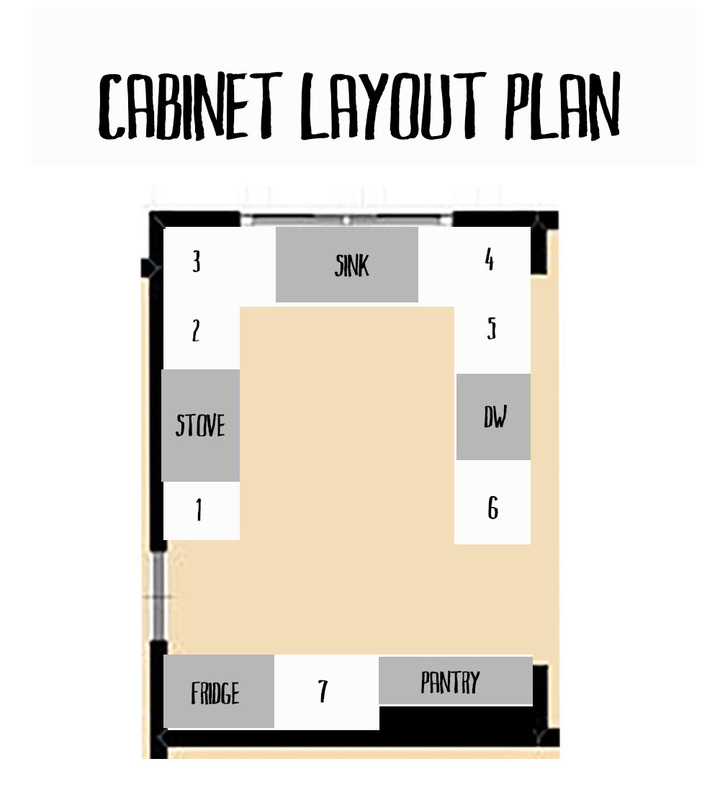 We looked at how we use our current kitchen and used that to plan the cabinets out as well. 18″ 3-drawer: This section will house cooking utensils and some pots and pans. 12″ 2-shelf Pull-out: This section will house spices and some other small appliances that sit easily on the shelves. Corner Cabinet with Lazy Susan: This corner cabinet is HUGE and really functional with the lazy susan. We’ll put bigger pots and pans, casserole dishes, baking pans, etc. here. Corner Cabinet with Lazy Susan: I’m not even sure what we’ll use this second corner cabinet for! They hold so much and really provide great storage. 24″ 3-drawer: This section will hold silverware, tuppeware, etc. 24″ 3-drawer: This section will hold a utility drawer up top and kids things below: bibs, plates, cups, etc. 24″ 2-shelves: Between the pantry and fridge, I’m creating a little baking station. The cabinet below has two shelves and will hold mixing bowls, some baking/pie pans, etc. You’ll notice I’m only talking about lower cabinets here. Like we’ve done in every kitchen we’ve designed, there won’t be any upper cabinets. That saves us a lot of money, but I also prefer that look. What amazes me, though, is we’re ending up with as much storage as we have in our current, much bigger, kitchen! It’s arranged a little differently, but it’s going to work great for us. I always get asked how we fit everything in a kitchen with no upper cabinets and it’s never been an issue. What I’ve always done is made a list of all the things we need places for and as I’m planning the kitchen, I plug in where each of those will go to make sure we’re covered. 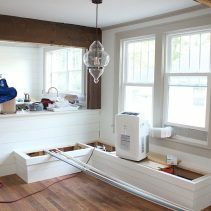 In this kitchen, we’ll have some open shelving around the stove for plates, cups, etc. Then, we’ll also do open shelving above the baking station cabinet between the pantry and fridge to house other baking necessities. I’ll have canisters of all my flours, etc. there to make it really easy to grab! Oh I am so excited! I was so worried about how we were going to make this kitchen work. It seemed so small to me and after laying it all out like this, I realize it’s actually a great size and will have everything we need! Up tomorrow, I’ll be sharing the design direction I’m taking with this space. I can hardly wait! Oh my goodness, y’all did SUCH a great job! So impressed by how you were able to make this space work for your family. 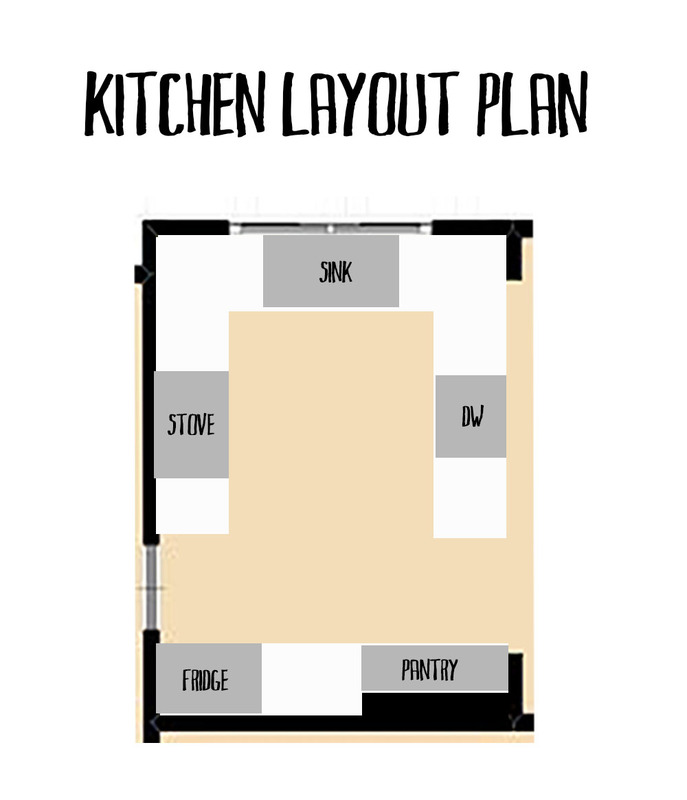 And kudos on the sink/dishwasher layout – our duplex unfortunately has them so close together that I have to trade off, sink duty or dishwasher access, one at a time. Not the most efficient and gets a tad (very) frustrating after a while! Can’t wait to see the design plan. This looks so good! We have a kitchen gut job in our (hopefully near) future. It’s helpful to see how you’ve planned it all out. Our kitchen is a decent size for our small house at around 15′ x 17′ but three of its corners have doorways (all of which have to stay) and it has a ridiculously low ceiling (like 6 1/2 ft) that can’t be raised (the joists are literally that low). I keep messing with design ideas, trying to find the best layout. I haven’t found it yet. Ha,ha. I’m excited to see your design plans! Amanda, don’t doorways make it so difficult?! 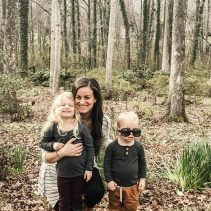 So hard to work around them 🙁 Wishing you luck, girl!! I’m so excited to follow along with your kitchen! I have a small kitchen and I look at as efficient ;). No wasted space, no duplicates, just what you need. And your pantry sounds perfect! Looking forward to the design portion! Long time reader, first time commenter. 🙂 I just wanted to pop in and say how excited I am to watch this house transform! We’re considering using stock cabinets and painting them ourselves to save on cost. VERY excited to follow along!! I think you are doing a great job with your space and have obviously put a great deal of thought into it. I really like your style. One thing I noticed about the refrigerator space, is that the doorway beside it is not quite in the corner. I have the same issue in my kitchen and have a side by side counter depth frig. I cannot open the freezer side door all the way because of the wall. It’s OK and it works but not as well as it should. At times it’s hard if I need to get something out that is larger. Unfortunately, we will probably have to replace it soon. I know that I can get a refrigerator with one big door but for it to open all of the way, the door would have to open to the right, which is not as practical to the rest of the room. Just thought I’d mention this because I’m interested to see what you will do. I like your designated baking area but I’ll bet you end up using the area between your sink and dishwasher more because it’s so open and bright and you can really spread out.